"I want to stay with you like this forever." I'll admit up front that aside from some cuisine and what little I can garner from the stacks of anime that work their way through my DVD player, I know very little about Japanese culture. Outside of the few live action features I've seen from Criterion - Good Morning, or their Kurosawa and Suzuki films, my exposure to the country's cinema and things like bunraku (Japanese puppet theatre) or kabuki, has been fairly nonexistent. 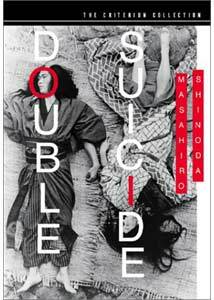 Needless to say, when a film like Masahiro Shinoda's 1969 film Double Suicide comes across my desk, I find it a little foreign, to say the least. Closely adapted from Shinju ten no amijima, a 1720 puppet play by Chikamatsu, Double Suicide infuses elements from the stage in an odd yet interesting way, by including the puppeteers (the kurago, dressed in black), as silent participants in many scenes. A classic tale of lovers who can't be together, yet can't live without each other, takes on a unique perspective in this presentation. Jihei (Kichiemon Nakamura), is a respected paper merchant, married with two children, yet for the past two and a half years he has been in love with a prostitute, Koharu (Shima Iwashita), for whom he would sacrifice everything. He has spent his family's fortune at the brothel, but can't raise enough to pay off her debts to the brothel's owner (Kamatari Fujiwara) and redeem Koharu from her life of prostitution. Knowing their places in society, both lovers realize that a life together is impossible, but they feel that they can be joined forever in death, in the form of double suicide. His wife's family finds out about his mistress, and tries to get Jehei to disown her, and despite his wish and promise to do so, he finds the bond unbreakable. Only his wife Osan (also played by Iwashita) will hold the key to his future happiness, though it may be in a way none of them ever expected. Like many foreign films, I didn't really know what to think of Double Suicide immediately after viewing it. Having placed some time between the experience and writing this review, it is clear how unique this piece is, and the elements that make it so add to its strangeness when viewing the film for the first time. The opening sequence serves as a perfect example—we see puppets being assembled by the kurago, while we hear a phone conversation discussing final details about the suicide scene for the picture, which bear no connection with what we are viewing. As the film begins to merge into the real world of live actors, the kurago, who would normally try to remain unseen during a play, are seen scurrying to hiding places within the live action. Additional forms of surrealisim enter as characters are frozen in place as others play their parts. Also noteable is the use of foreground imagery to frame the scenes, shooting through wall divisions or from behind objects or people. Contrast plays an important role in the look of the film, and is used to great effect. Sparse set design focuses the attention on the characters, while the background kurago seemingly try to keep their presence as non-interfering as possible. While the underlying theme of the film is not all that new, its presentation certainly places it in a realm of its own. Double Suicide is a film that would definitely benefit from repeated viewings, since much of the impact of its original elements may prove confusing upon first exposure. I was not alone in misunderstanding the role of the kurago, as some of my colleagues were under the same false assumption I was as to their purpose prior to reading through the supplied supplemental essay. It is quite a beautiful piece of black and white cinematography, and Criterion's transfer certainly heightens its asthetic value. Image Transfer Review: The 1.33:1 image is presented in a glorious black and white transfer. Film grain is well-rendered, and greyscale is handled near flawlessly. The picture is crisp without any signs of edge enhancement. Criterion has done it again with a great presentation. Audio Transfer Review: The Japanese audio track is presented in 1.0 mono. Tape hiss is fairly present throughout as is some crackling, and there is some distortion on occasion during extremely loud passages. That said, by not gating the audio, the subtle ambient sounds and low level detail are clearly audible, which is a reasonable tradeoff. There also did seem to be some sync issues at times. Extras Review: Criterion's standard color bars are the only on disc extras. The trifold insert features an essay on the film which helps explain some of the more obscure ideas behind the production. Also included is Criterion's 48 page catalog. Criterion has done what they do best here - give obscure and one of a kind films a respectable release for its audience. The unique elements in the film make for interesting art house fare, though it may be too challenging for many. Double Suicide's place in the Criterion is justified by its originality, but like other films in the collection may not appeal to a broad audience. That said, this is an extremely solid release for fans in terms of presentation quality, though as a newcomer I would have liked a bit more in the way of background on the filmmaker and the film.